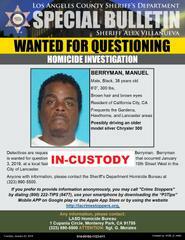 Los Angeles County Sheriff's Homicide investigators have advised that suspect, Manuel Berryman, has been arrested. Today, Tuesday February 19, 2019, at approximately 12:00 p.m., he turned himself in to authorities at Lancaster Station. Suspect Berryman had an arrest warrant issued for his involvment in an assault that resulted in the death of a 61 year old man, on January 3, 2019, at a local fast food restaraunt in Lancaster. The suspect has been booked for Murder and is being held in lieu of $2,000,000 bail. Mr. Manuel Berryman is possibly driving an older model silver Chrysler 300 and he also frequents the Lancaster area. 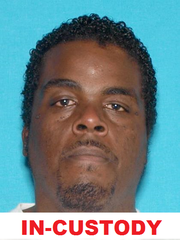 Sheriff’s Homicide Bureau Detectives are seeking assistance in locating 38 year old Manuel Berryman (pictured), a resident of California City, CA. Berryman is described as a Male African American, 6 feet tall, weighing 300 pounds with brown hair and eyes. He is wanted for questioning regarding the murder of 61 year old Frank Borsotti that occurred January 3, 2019 at a Lancaster fast food restaurant on the 43600 block of 10th Street West. Los Angeles County Sheriff’s Department Homicide Bureau Detectives are continuing to investigate the death of a person. The incident occurred on Thursday, January 3, 2019 at approximately 12:45 p.m. on the 43000 block of 10th Street West in Lancaster. Detectives have learned that at approximately 12:45 p.m., Lancaster Station deputies responded to the 43000 block of 10th St West, Lancaster at the “Jack in the box” parking lot, regarding an assault that had just occurred. Upon the deputies arrival, they found the victim on the ground suffering from obvious trauma. He was transported to a local hospital where he was pronounced dead. The suspect is a male black, who was last seen as the passenger in a champagne colored 4 door sedan, which was last seen headed northbound on 10th Ave West, Lancaster. Homicide Detectives are looking for any additional witnesses who may have been at the scene at the time of the incident. Los Angeles County Sheriff's Homicide detectives are responding to investigate the death of a man. The incident occurred on Thursday January 3, 2019, at approximately 12:45 p.m., on the 43600 block of 10th Street West, Lancaster.